This year over 60 teams have their eyes and shovels set on winning the prestigious American Institute of Architects' Sandcastle Competition Golden Bucket Award. Firms begin months in advance generating ideas, developing designs, and assigning duties. On the day of the event the teams, stretched along the beach front, meticulously sculpt their piles of sand and work non-stop for five hours. The judging of the sculptures is rated on originality of concept, artistic execution, technical difficulty, carving technique, and utilization of the site. In addition to the Golden Bucket, awards are given in several categories including Traditional Castle, Architectural Icon, Kidtastic: Fables & Folklore, Houston-centric, Geometric, Pop Culture: Decades, Marine Life as well as Public Favorite, Tallest Standing Structure, Greatest Feat of Structural Ingenuity, team t-shirt design, team signage, and costume. At the end of the day, everyone goes home with memories of a great day at the beach filled with fun, sand, and sun. 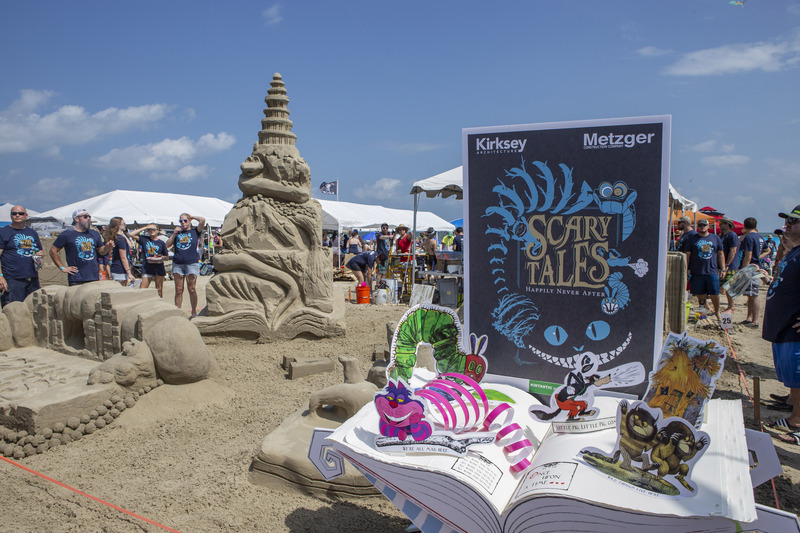 The AIA SandCastle Competition is a fund-raising event for American Institute of Architects Houston and Architecture Center Houston Foundation as well as one of the top five revenue generating events for the City of Galveston. The event is underwritten by Thomas Printworks. 10:00am - 3:00pm Teams compete and build. Parking at East Beach Galveston is $15 cash only collected by the Galveston Parks Board. There is no ATM. ADDITIONAL PARKING AND SHUTTLE BUSES WILL BE AVAILABLE FROM STEWART BEACH. Reserve your beach umbrella & chairs in advance by contacting Beach Buddies at 409.443.5103. If you are interested in particpating in Sandcastle as a team or sponsor please contact Debby Joiner (teams) at debby@aiahouston.org or Aleks Savitski (sponsors) at aleks@aiahouston.org or call 713-520-0155.